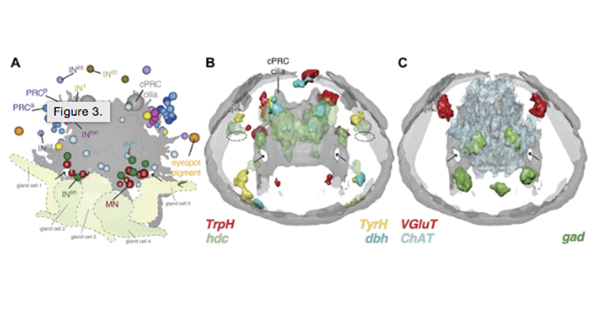 There is an interesting paper from an evo devo perspective out of the Jékely laboratory, looking at the connectomics of some of the earliest of organized visual systems in the Platynereis dumerilii larva. They have described a visual circuit consisting of 71 neurons and 1,106 “connections”. The cool thing about this study was that they were also able to combine behavioral experiments with ablations revealing the ability to detect spatial light, directing movement or taxis in the direction of the light. Its too bad I did not visit with them last time I was in Tübingen as it would have been good to talk connectomics and techniques with them. I am encouraged that they used serial section transmission electron microscopy to perform circuit level analysis as we think its the right approach for circuit level analysis, though I worry that the resolution was too low to image gap junctions, though they did mention looking for them. Regardless, I would have loved to see their setup and talked with them.